The CSO has today released its official figures for Irish milk production in 2015 the first full year post quota. Irish milk supplies were over 13.3% or 750m litres higher over the course of 2015 compared to 2014. The domestic milk intake by creameries and pasteurisers was estimated at 179.3m litres for December 2015. This was 30.3% above the corresponding 2014 figure, according to the CSO figures. EU milk deliveries increased by 5.5% in November, the highest monthly increase in 2015, according to latest data from the Milk Market Observatory (MMO). 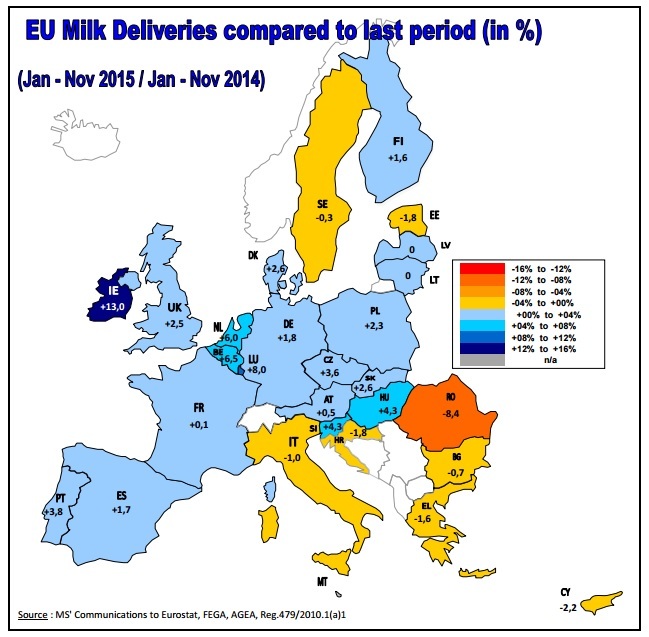 The data also shows that EU milk deliveries between January and November were up 2.2%. 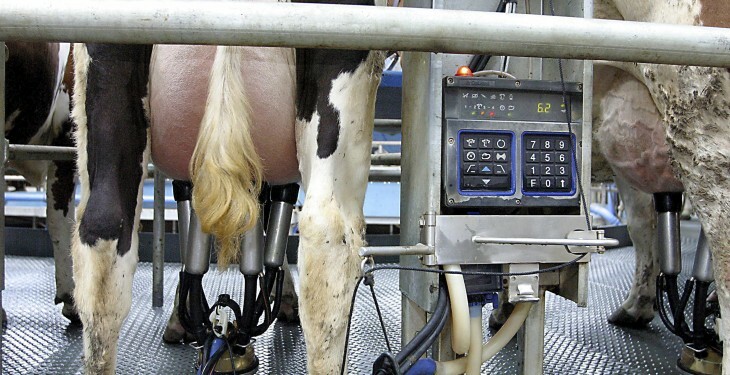 The increase in production comes as milk prices remain at low levels across Europe. Continued strong milk production comes as milk prices remain weak both in Ireland and across the EU. According to commentators, markets continue to bounce along the bottom in Europe. 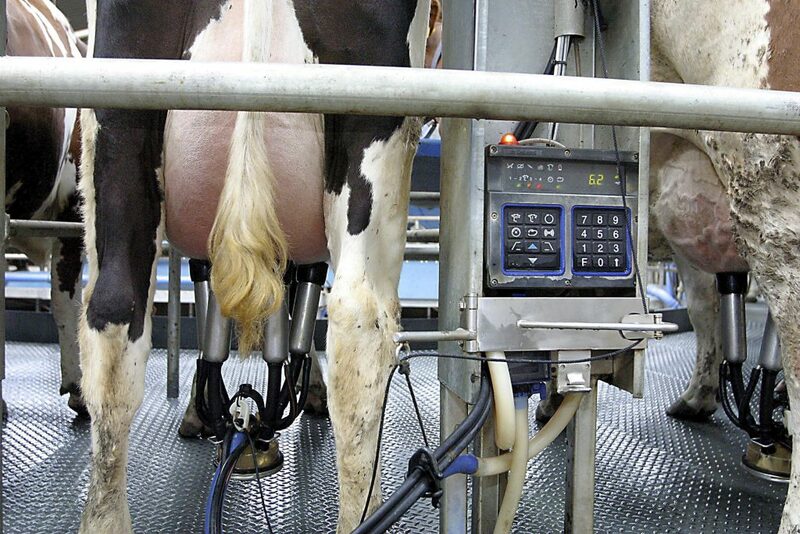 Currently, if dairy product values were expressed in a milk price they would equate to between 20c-21c/L. Comparing the December 2015 Irish milk produce figures with those for December 2014 shows that total milk sold for human consumption increased by 3.2% to 40.8 million litres while butter production was up 44.2% to 8,520 tonnes. High EU production has resulted in an increase, since April, in the production of SMP by 8.7% and butter of 4.8%, according to TJ Flanagan of ICOS. He highlights, that between the end of June 2015 and Jan 4, 2016, 46,639 tonnes of SMP were offered into intervention. He also said this should be considered alongside 71,489tonnes of SMP in either the 210 day or 365 day private Storage Aid Schemes. “With Europe running at around 2% up on production, it is apparent that nearly half the growth is being put into either Intervention or PSA. Flanagan said it is clear that the market will remain weak until either consumption grows in response to low prices; difficult, given low oil prices and poorer developing countries, or supply growth eases significantly.